PS1 Rated E Dance Dance Revolution- Disney Mix is a hard to find DDR game it sells for $75 or so on Ebay. It was made in 2001 and the copies that remain are scare and valuable. This is a noteworthy addition to any DDR collection. Unlike many of the other DDR games out there this game is geared more for kids. The grading is more lenient and the songs are clean. There are twenty songs total with nine Disney classics like It’s a Small World (2 different versions), Mickey March, Zipedy Doo Dah, and Supercalifragilisticexpialidocious. You have your Main Game mode, which is your typical three songs and a score. Free Play mode lets you play unlimited songs. For beginners there’s a lesson mode to teach you the basics. Training mode will help you master songs. Dance magic is a fun mode where you battle against another player and by doing well will make the other person experience more challenging moves. Whomever has the highest life bar at the end, wins. Before In the Groove this was the only DDR game with this mode, and for many this was the main selling point of the game. 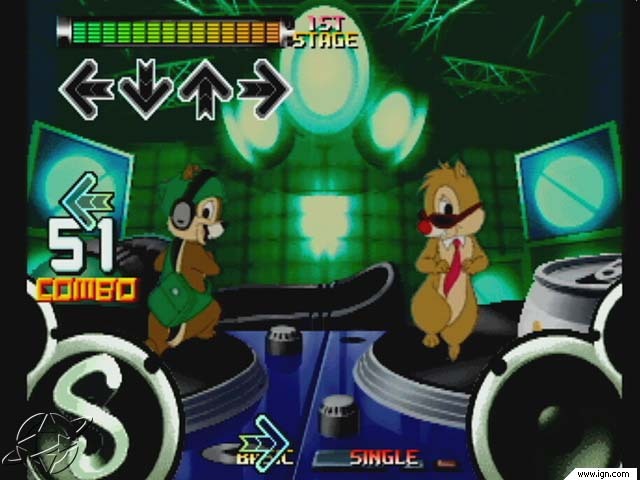 In the standard game mode the song difficulty is rated by stars with the maximum being five. Trick mode has up to eight stars. Maniac mode can be unlocked after passing every song in trick mode. There is something for everyone and every level in this game. The grading is standard but the overall scoring is merciful, it’s not hard to get an AAA. This is an area again where there is something for everyone. There are some good Disney songs to dance to, though a couple I have never heard of before. There are some oldies as well like Let’s Twist Again and Mr. Bassman. DDR lovers will recognize some classics like B4U, Midnight Blaze, Share My Love and Higher. The biggest disappointment is the number of songs. Most Konami games come with fifty tracks and DDR Disney Mix has a sparse twenty. Keep in mind that this is a PS1 game and the graphics are not as pretty as PS2 DDR games, still they are pretty good. You’ll see many animated Disney characters as you dance. Sometimes the arrows blend in with the animation, which can make it easy to miss a step if you’re not careful. This is by far the cleanest DDR game out there when it comes to songs. Even though there is a Dance Magic mode there’s no magic or spell casting involved. This game is certainly not cheap and the song list is quite short. On the plus side it does offer a very fun “new” game play mode. It’s the most kid friendly title in many respects but it can also challenge seasoned DDR players as well.